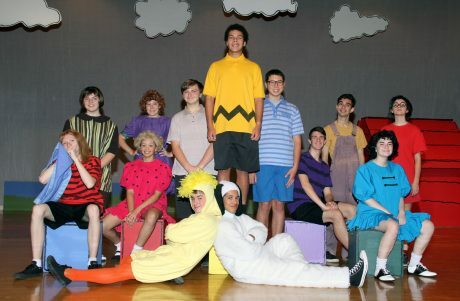 Pictured here are Fulton students Wesley VanBuren as Woodstock, Ronde Wood as Snoopy, Marcus Doran as Linus, Kira Whitehead as Sally, Nick Brown as Charlie Brown, Alex Blaine as Schroeder, Emily Sohoski as Lucy, Olivia Hawthorne as Peppermint Patty, Jadelyn Phillips as Frieda, Griffin Marriner as Shermy, Justin Atwater as Franklin, Anthony Galletta as Pig-Pen and Maddison Majeski as Marcie. FULTON – Charles Schulz’s beloved Peanuts characters take to the G. Ray Bodley stage this weekend as Quirk’s Players present the family favorite Broadway musical, You’re A Good Man, Charlie Brown. The story focuses on a typical day in the life of Charlie Brown and includes such memorable songs as, “My Blanket and Me,” “My New Philosophy,” “Book Report,” “Beethoven Day” and “Happiness” to name a few. The production is under the direction of Rob Lescarbeau and Tom Briggs, with music direction by Stephanie Almeter and dances choreographed by Doreen Kelly. Performances will be presented in the G. Ray Bodley High School auditorium on October 25-26-27 at 7:30 p.m.
You’re A Good Man Charlie Brown is made possible with funds from the Decentralization Program, a regrant program of the New York State Council on the Arts with support of Governor Andrew Cuomo and the New York State Legislature and administered by CNY Arts.